A good friend of mine has had a gorgeous 1982 Peugeot Centennial Edition (PH12) tucked safely away in his basement since I met him years ago. Whenever I would drop by, I would ask to take a peek at it and he would gladly show it off. He purchased the bike used but from the original owner only a couple of years after its creation in 1982. He rode it throughout his time at the University of Oregon, then, upon graduation, the bike was set aside. 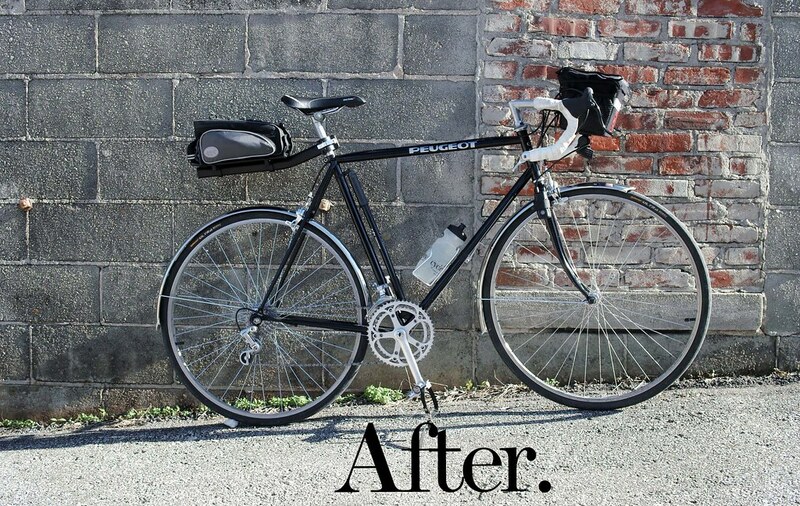 Seeing a bicycle that has obviously been used and enjoyed then has an premature retirement is a sad sight for me, so I offered to breathe new life into the Peugeot and freshen it up in hopes that this bike will once again enjoy consistent usage. To give a little background info, this bike is a wonderful representation of the mini aero bike boom that occurred back in the 80’s when many manufacturers tried their hand at aero profile tubing for the top and mid and lower ranges of their bicycle model lineup. 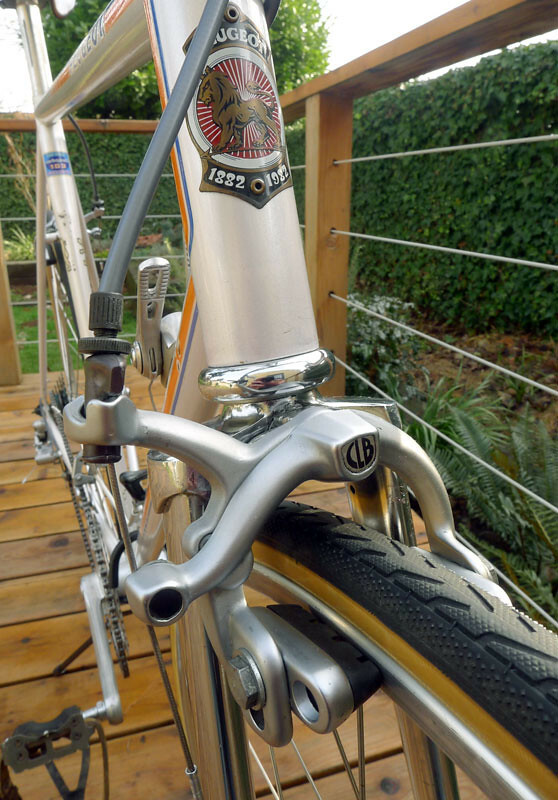 The Centennial bike, made of Carbolite 103 steel, was basically a “flattened” PH10 frame as it has the same tubing material and stamped dropouts, although it does have some special touches like the internal top tube cable routing (for both internal brake and shifter cables) to add to the aero theme, plus the special Centennial badging. 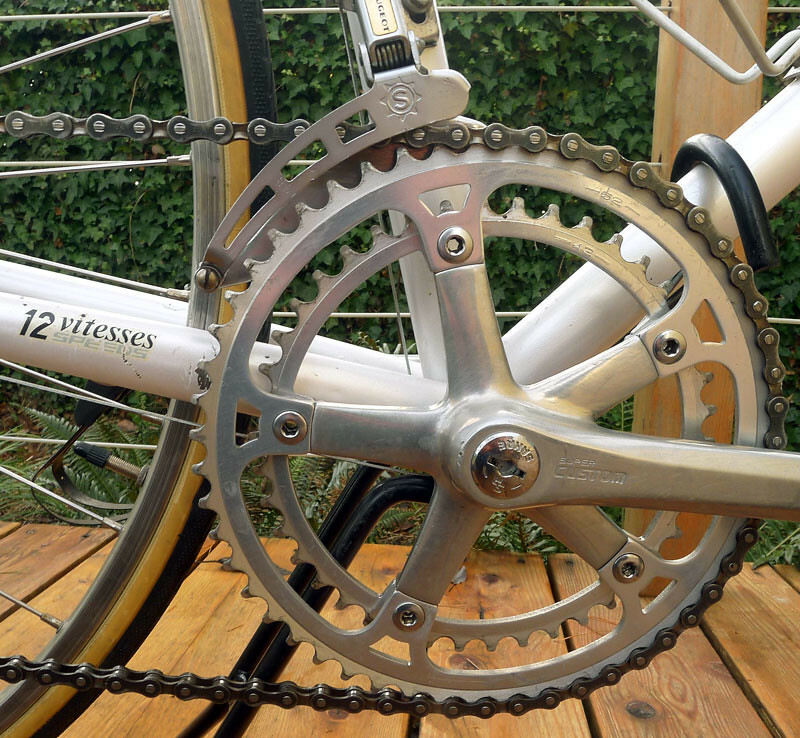 It also shares the now obsolete French type front derailleur brazed on mounting. 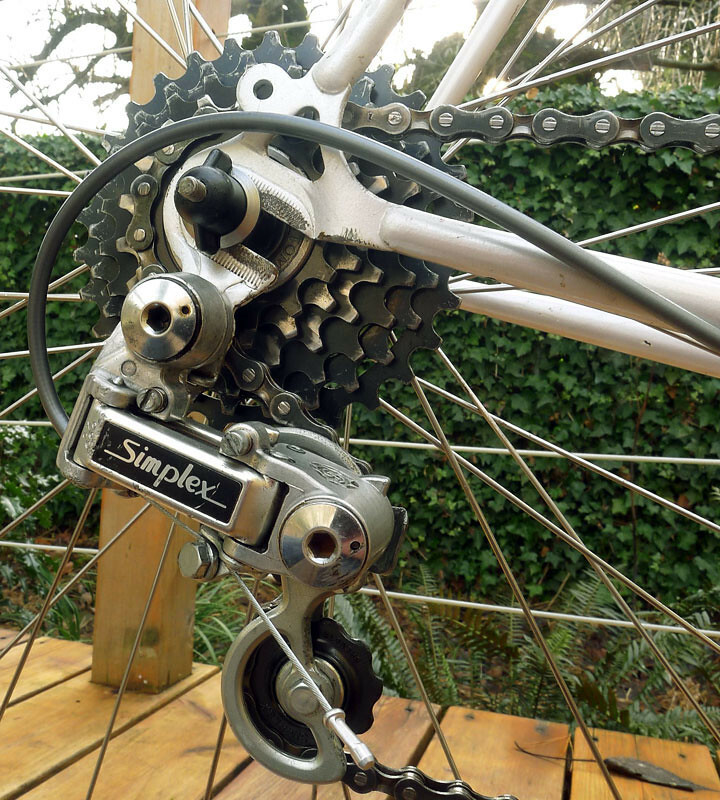 This cycle is also equipped with the now very sought after, very light and I suspect now rare CLB brakeset along with Simplex Super LJ derailleurs. The funny thing about this model of Peugeot is that it was supposedly released as a special edition for the Centennial which implies that not as many were built as other models of that single year. However, most of these PH12’s s were bought and lightly ridden or instantly stashed away as collector bikes, the result being many are still out there and are now being sold in the used bike market that are in fantastic condition. In my opinion, this would be an excellent example of that. Due to the exceptional condition this bike was already in, a revitalization was not too intensive. There was surface rust to clean off where cuts, nicks and scrapes had occurred. Once removed, a thin layer of clear coat was then brushed over to inhibit the recurrence. I then followed up with a layer of high quality wax to coat and bring out the brilliant pearlescent shine of the frame. 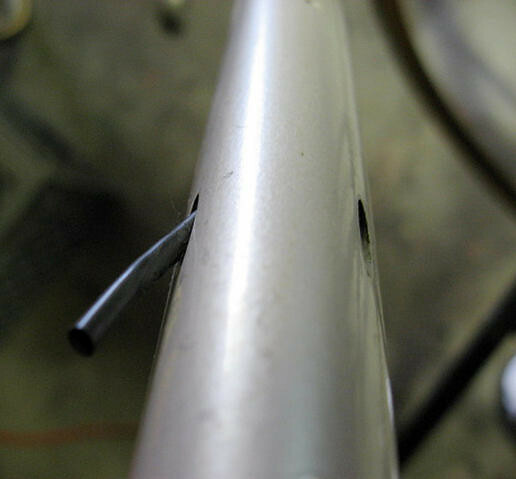 While cleaning, I foolishly did not feel it was necessary to secure the plastic cable guide sleeves on the down tube. As a results, one sleeve fell out of the frame. This caused a fair amount of trial and error to thread the sleeve back through the tubing. This was not an overly easy task. I tried multiple methods of pulling the sleeve back through and in the end it took a combination of compressed air and careful usage of a dentists pick to bring it back out again. Whew! Another challenge was bringing this beauty back to stock. My buddy made it very clear that he wanted the bike as factory fresh as possible, including consumable items (cables, brake pads, tires, etc.). This posed a challenge with some items, most notably the ultra rare, early version CLB aero brake lever hoods. 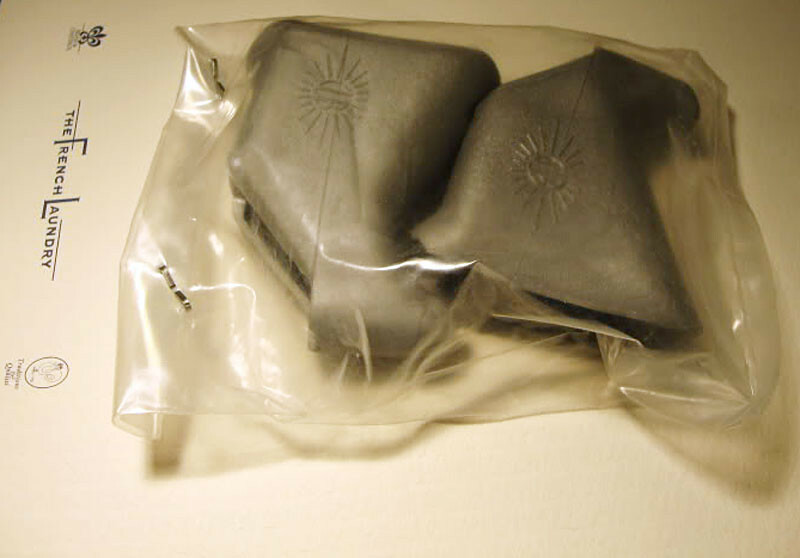 Other restoration experts told me it took them years to find replacement CLB hoods. This certainly dampened my spirits but by the good grace of luck, a friend had bought a few NOS sets from a Swiss eBayer a few months prior and generously spared a pair for the project. Although the set he provided were a silver/grey color and not black, as was originally provided with the Centennial bike. I was not about to get too picky knowing the scarcity of these hoods so I gladly cut my losses feeling extremely lucky to receive the proper period appropriate hoods for these rare brake levers. Plus, they would still look perfectly acceptable combined with the Peugeot’s pearl white paint and silver bar tape. 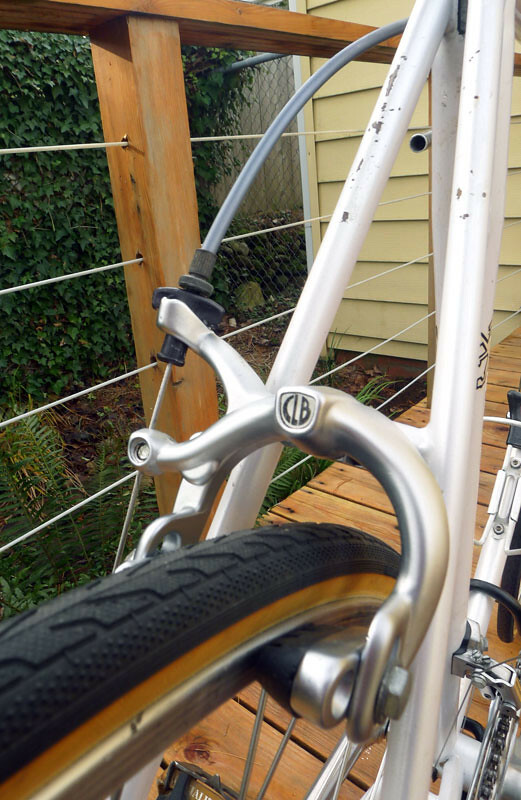 In fact, the bar tape is the one item that still hangs, leaving the project 95% complete. The original silver Ambrosio bike ribbon has proven to be an item as rare as the CLB hoods, except this time, nobody is coming to my rescue. I still continue to comb through different websites, and of course eBay, eagerly seeking out this specific and now obsolete tape. Once I find the elusive substrate, I will get a final shot of the bike in its entirety. Until then, these shots will have to suffice. Cool bike. I have a soft spot for Peugeot bikes of any sort, and in a weird sort of way, also for Carbolite 103. Kind of heavy material, but the ride quality is very nice. Here’s a fun fact that I read about while researching this bike. 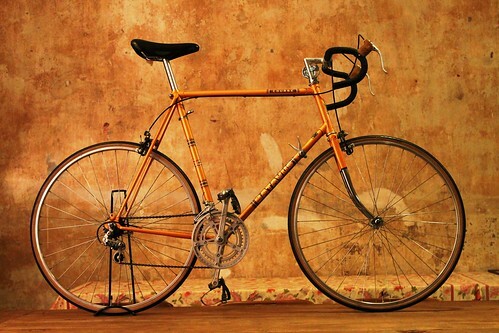 Since this was a special edition, Peugeot wanted everything on the bike to be French, including the frame. Columbus tubing would have been a much lighter and probably better choice for quality but alas, it is not a French company. Hence the Carbolite. As you mention, even though it is a touch heavier, I do not think the ride quality is sacrificed. My “lowly” 1984 P8 (http://farm6.staticflickr.com/5148/5697827084_d567fa9a9e_b.jpg) is constructed from Carbolite 103. Yup, it’s definitely heavier than my PX10, but frankly it is a far better riding machine in every aspect except for weight. Awesome bike! Could you mention which are those tires please? No problem! Those are the infamous and super long lasting Panaracer Pasela’s. 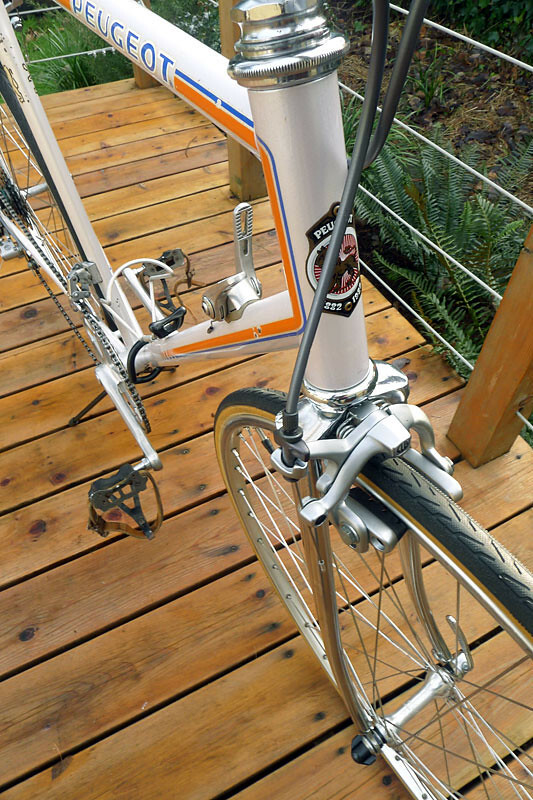 If you haven’t found the silver bar tape yet, if available, perhaps during the interim your friend will accept orange. As you stated, good examples of this bike are likely to begin showing up—here’s an orange-taped bike, looks sharp! Fortunately it’s too small, otherwise I’d be tempted to buy it. Nice find, Paul. The pearl PH12 does look great with orange bar tape, however, that is an option I have already proposed at one point but I was told that only silver will due. 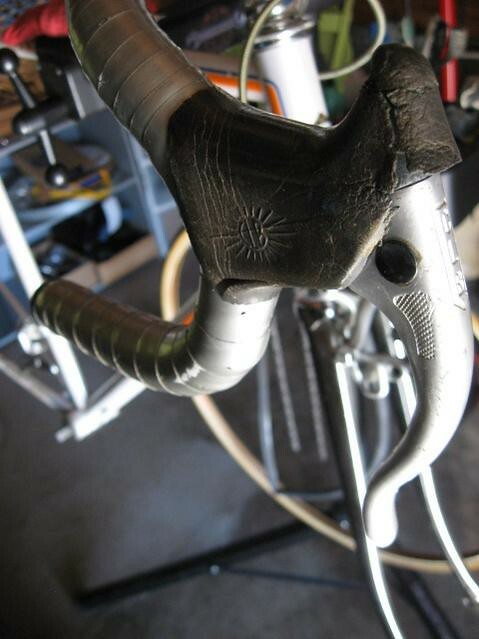 In fact, I am still on the lookout for this bar tape. I have a few items I search for on eBay nearly every day and silver Ambrosio bar wrap is in that group. I have also reached out to several different parties (shops, individuals, etc.) which sell old stock but so far, the tape proves to be extremely elusive. To this day, the bike still sits 98% complete, bar wrap being the missing element. Luckily, my buddy has ridden it a few times without it, so at least it is getting ride time. If/when I find the tape, I will certainly update the post! Lovely bike and I can say this from experience, as i ride one every day. Mine is not quite in the same condition but one day I might try and renovate it as best as possible. Gems like your Peugeot are becoming more and more challenging to find as the years click by. Take care of your ride but certainly don’t be afraid to take it out and put some miles on it! I have named my Centennial, “the boy”. This was the Amercian colonial’s nickname for the Marquis De LaFayette. I am still slowly working on the restore. Each time I ride it, I am stunned by how perfectly it fits me with no adjustment. I did switch the saddle, as to save the original. Once I realized how rare it is, I could not keep it on the bike, until the restore is complete. Ha! I can’t even find a photo of that type of saddle un-attached from the bike. My favorite ride, of all my 10 respectable bikes. I wish I could say that I had some saddle time with this beauty so I could comment more on the fit but as soon as it was finished, it went right back to my pal. Besides, a maiden voyage should be had by the owner, not the builder, even if I could justify it as a “shakedown ride”. Please keep us updated to your PH12 restoration, Lucky Wrench! Very good point on the tires! However, some compromises had to be made especially with what I was provided in time, budget and feasibility. Not everything I did was completely back to stock but since this is not going to be a show bike, I was free to take some liberties. The Panaracers were an strong, long-term solution for actual ridability in terms of material and comfort. 700x19c sounds painfully tiny! A good and very affordable choice would be the Michelin Dynamic Classic. I removed the Dynamic Classic print with a Dremel. I used the same set of tires (25mm) for L’Eroica 2013 (75km) and 2014 (135km). Considering that half of the race is on unpaved roads and I had no flat tire, this is a classic, affordable, good quality and French solution! The tires cost € 10 here in Germany! Philipp, using a Dremel to remove the lettering on the Michelin’s is a clever solution to keep the classic look of the gumwall tires but allowing for the modern tire technology of today. Thank you for also providing images and mentioning the bit about your experience at L’Eroica. I believe you may be the first rider that I know of who has escaped unscathed, without a flat tire, on the ride. Bravo! I’ve had this bike since high school. I recently restored mine as well – yours looks great! Any thoughts on replacing the aerodynamic water bottle and cage? I am pleased to hear yet another PH12 has been saved and is now back on the streets. Nice work! As for replacing the aerodynamic water bottle/cage, I very recently acquired both from a friend who happened to have one “lying around.” I haven’t passed it along to my pal who owns this Peugeot quite yet but I plan to very soon. I’ll be taking close note of the look on his face when he sees it! These bottles are becoming increasingly more of a rarity. If you too are looking for one, I would try bikeforums or eBay. However, keep in mind that I would advise to use this as more of an aesthetic piece only and not for actual water storage. Over the decades, the plastic has become quite delicate and the water slide decals are extremely fragile and come off easily when wet. Im from Belgium and got the exact same bike; mine is like 99% original. as I think it was originally on these bikes. 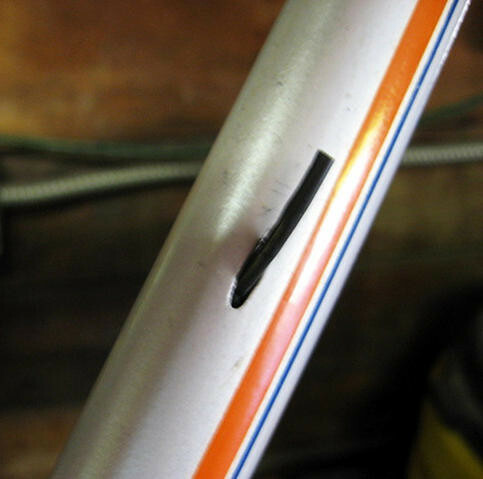 My research also seems to indicate/confirm that Benotto Cellotape was the tape of choice on the PH12. Although Ambrosio bike ribbon what was on the PH12 I worked on and my pal seems to like it more than the feel of Cellotape. So he wants to stick with that. But, technically, to be period and part appropriate, Cellotape would be the substrate of choice. I’m having difficulties finding new CLB hoods for my PH12. Any opinions on Dia Compe brake-hoods who as I researched may fit well on the place of CLBs? 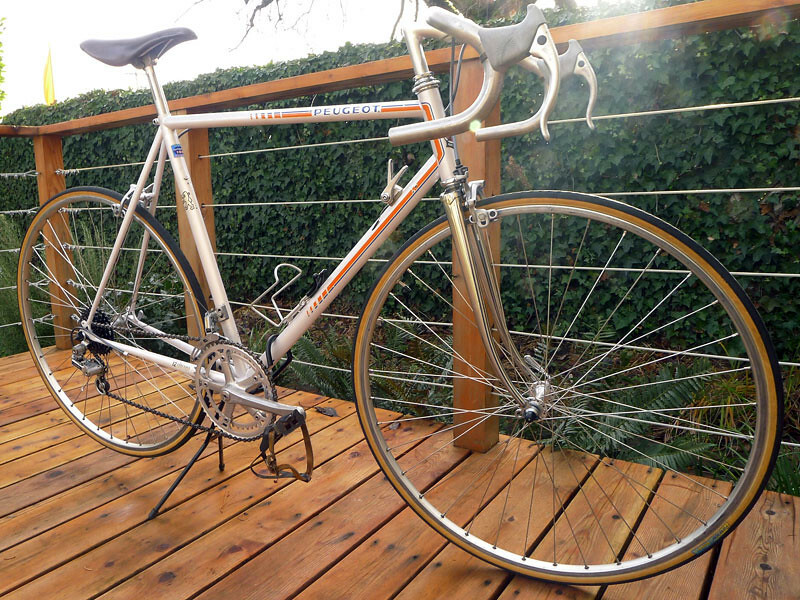 When I was restoring this bicycle, I was lucky enough to find my CLB hoods with ease, even though others had spent years hunting for them. So with that, unfortunately I cannot answer your question on if Dia-Compe brake hoods will fit over your CLB levers as I did not pursue any other options or manufacturers. My suggestion would be to visit the BikeForums Classic and Vintage website (you can find the URL under my Links). There are sure to be some who have attempted this swap or at least can point you in the right direction. Thank you for the info! I’ll post the results later. Hi have one too,totely original but with a few more rust spots,will be striping down and giving it a total rebuild on my return from New Zealand and hope to ride it in this years L’Eroica. Does anyone know if you can still get hold of the decals as I am thinking of getting the bike re chromed and re sprayed. If the link doesn’t work search for ‘Peugeot PH12 decal’ on eBay.com. Apologies for the short reply. Love mine, haven’t ridden it yet. You’re quick on the draw, Matthew! Thanks for chiming in. I have one bought it in 82 and built it. Kept it in the attic for 33 yrs still looks great. How much are they worth today. Great to hear you are one of the lucky ones! Are you planning on dragging it out of the attic to let it stretch its legs? Value is such a subjective thing and depends on so many factors such as region of the world/country, season and year. Quoting something now will likely not be accurate in another year so. And knowing this post has and will exist in the future, I’d rather not put a price out there for others to use as a benchmark. But, a good way to check is to run a search on Craigslist and eBay to see what others have (or are) selling theirs for. If you are interested in parting with it, however, please do get in touch as I am always interested in hearing about vintage bicycles for sale and have access to communities which you may not. Hi John. What framesize is yours? 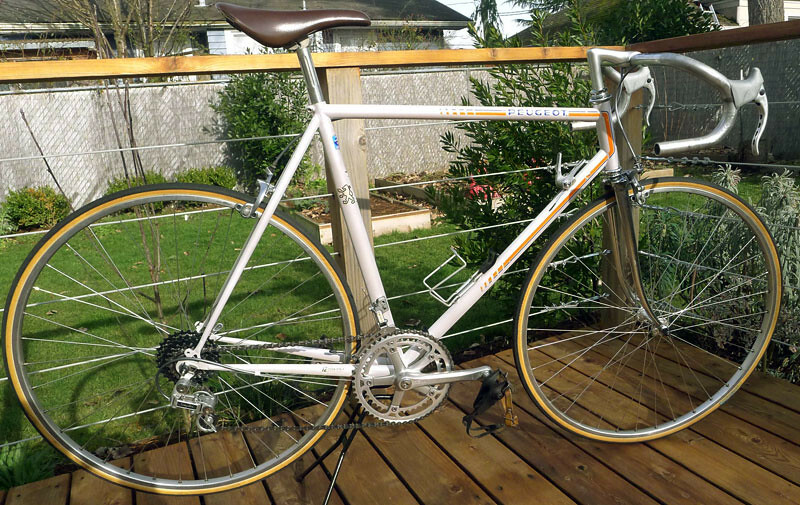 This entry was posted on May 16, 2012 by Josh C. in Cycling Projects, Topics and tagged Aero, Ambrosio Bike Ribbon, Carbolite 103, CLB, Peugeot, Peugeot Centennia, PH10, PH12, Sakae, Simplex, SLJ6600, Stronglight.